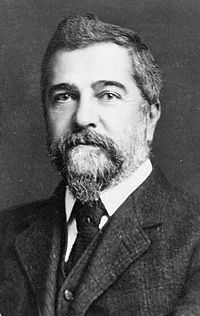 Louis Comfort Tiffany was born in New York City, the son of Charles Lewis Tiffany, founder of Tiffany and Company, and Harriet Olivia Avery Young. He attended school at Pennsylvania Military Academy in West Chester, Pennsylvania, and Eagleswood Military Academy in Perth Amboy, New Jersey. His first artistic training was as a painter, studying under George Inness in Eagleswood, New Jersey and Samuel Colman in Irvington, New York. He also studied at the National Academy of Design in New York City in 1866–67 and with salon painter Leon-Adolphe-Auguste Belly in 1868–69. Belly's landscape paintings had a great influence on Tiffany. Tiffany started out as a painter, but became interested in glassmaking from about 1875 and worked at several glasshouses in Brooklyn between then and 1878. In 1879 he joined with Candace Wheeler, Samuel Colman, and Lockwood de Forest to form Louis Comfort Tiffany and Associated American Artists. The business was short-lived, lasting only four years. The group made designs for wallpaper, furniture, and textiles. He later opened his own glass factory in Corona, New York, determined to provide designs that improved the quality of contemporary glass. Tiffany's leadership and talent, as well as his father's money and connections, led this business to thrive. In 1881 Tiffany did the interior design of the Mark Twain House in Hartford, Connecticut, which still remains, but the new firm's most notable work came in 1882 when President Chester Alan Arthur refused to move into the White House until it had been redecorated. He commissioned Tiffany, who had begun to make a name for himself in New York society for the firm's interior design work, to redo the state rooms, which Arthur found charmless. Tiffany worked on the East Room, the Blue Room, the Red Room, the State Dining Room, and the Entrance Hall, refurnishing, repainting in decorative patterns, installing newly designed mantelpieces, changing to wallpaper with dense patterns, and, of course, adding Tiffany glass to gaslight fixtures and windows and adding an opalescent floor-to-ceiling glass screen in the Entrance Hall. The Tiffany screen and other Victorian additions were all removed in the Roosevelt renovations of 1902, which restored the White House interiors to Federal style in keeping with its architecture. In the beginning of his career, Tiffany used cheap jelly jars and bottles because they had the mineral impurities that finer glass lacked. When he was unable to convince fine glassmakers to leave the impurities in, he began making his own glass. Tiffany used opalescent glass in a variety of colors and textures to create a unique style of stained glass. He developed the "copper foil" technique, which, by edging each piece of cut glass in copper foil and soldering the whole together to create his windows and lamps, made possible a level of detail previously unknown. This can be contrasted with the method of painting in enamels or glass paint on colorless glass, and then setting the glass pieces in lead channels, that had been the dominant method of creating stained glass for hundreds of years in Europe. The First Presbyterian Church building of 1905 in Pittsburgh, Pennsylvania, is said to be unique in that it uses Tiffany windows that partially make use of painted glass. [dubious – discuss] Use of the colored glass itself to create stained glass pictures was motivated by the ideals of the Arts and Crafts movement and its leader William Morris in England. Fellow artists and glassmakers Oliver Kimberly and Frank Duffner, founders of the Duffner and Kimberly Company and John La Farge were Tiffany's chief competitors in this new American style of stained glass. Tiffany, Duffner and Kimberly, along with La Farge, had learned their craft at the same glasshouses in Brooklyn in the late 1870s. In 1889 at the Paris Exposition, Tiffany was said to have been "overwhelmed" by the glass work of Émile Gallé, French Art Nouveau artisan. He also met artist Alphonse Mucha. He trademarked Favrile (from the old French word for handmade) on November 13, 1894. He later used this word to apply to all of his glass, enamel and pottery. Tiffany's first commercially produced lamps date from around 1895. Much of his company's production was in making stained glass windows and Tiffany lamps, but his company designed a complete range of interior decorations. At its peak, his factory employed more than 300 artisans. 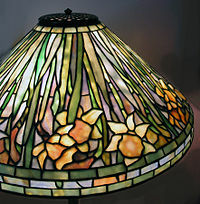 Recent scholarship led by Rutgers professor Martin Eidelberg suggests that a team of talented single women designers – sometimes referred to as the "Tiffany Girls" – led by Clara Driscoll played a big role in designing many of the floral patterns on the famous Tiffany lamp as well as for other creations. Tiffany used all his skills in the design of his own house, the 84-room Laurelton Hall, in the village of Laurel Hollow, on Long Island, New York, completed in 1905. Later this estate was donated to his foundation for art students along with 60 acres (243,000 m²) of land, sold in 1949, and destroyed by a fire in 1957. Hilda Goddard Tiffany (1879–1908), the youngest. Dorothy Trimble Tiffany (1891–1979), who, as Dorothy Burlingham, later became a noted psychoanalyst and lifelong friend and partner of Anna Freud. Altar designed by Louise Tiffany at the Fourth Universalist Society in the City of New York. Tiffany died on January 17, 1933, and is buried in Green-Wood Cemetery in Brooklyn, New York. Tiffany is the great-grandfather of investor George Gilder. The Charles Hosmer Morse Museum of American Art in Winter Park, Florida houses the world's most comprehensive collection of the works of Louis Comfort Tiffany, including Tiffany jewelry, pottery, paintings, art glass, leaded-glass windows, lamps, and the Tiffany Chapel he designed for the 1893 World's Columbian Exposition in Chicago. After the close of the exposition, a benefactor purchased the entire chapel for installation in the crypt of the Cathedral of Saint John the Divine, New York in New York City. As construction on the cathedral continued, the chapel fell into disuse, and in 1916, Tiffany removed the bulk of it to Laurelton Hall. After a 1957 fire, Hugh McKean (a former art student in 1930 at Laurelton Hall) and his wife Jeannette Genius McKean rescued the chapel, which now occupies an entire wing of the Morse Museum which they founded. Many glass panels from Laurelton Hall are also there; for many years some were on display in local restaurants and businesses in Central Florida. Some were replaced by full-scale color transparencies after the museum opened. A major exhibit at New York's Metropolitan Museum of Art on Laurelton Hall opened in November 2006. An exhibit at the New-York Historical Society in 2007 featured new information about the women who worked for Tiffany and their contribution to designs credited to Tiffany; the Society holds and exhibits a major collection of Tiffany's work. In addition, since 1995 the Queens Museum of Art has featured a permanent collection of Tiffany objects, which continues Tiffany’s presence in Corona, Queens where the company's studios were once located. Reid Memorial Presbyterian Church in Richmond, Indiana has a collection of 62 Tiffany windows which are still their original placements, but the church is deteriorating and in jeopardy. 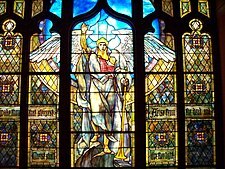 In 1906, Tiffany created stained glass windows for the Stanford White-designed Madison Square Presbyterian Church located on Madison Avenue in Manhattan, New York City. The church was Tiffany’s place of worship, and was torn down in 1919 after the Metropolitan Life Insurance Company bought the land to build their new headquarters. Tiffany had inserted a clause in his contract stipulating that if the church were ever to be demolished then ownership of the windows would revert to him. Tiffany enjoyed staying at the Mission Inn in Riverside, California, and had become friends with the founder of the Mission Inn, Frank Augustus Miller, so, after meeting with Miller in New York, Tiffany shipped the windows to the Mission Inn; they arrived there in 1924, and were stored until the inn's St. Francis Chapel was completed in 1931. There are six rectangular windows and a 104” diameter window in the rear of the chapel, as well as another 104” diameter window is in the Galeria next to the chapel. 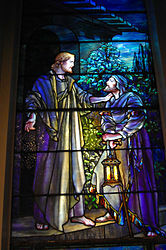 A smaller window entitled “Monk At The Organ” featuring a Franciscan friar, is in St Cecelia’s Chapel, a wedding chapel, and is engraved with Tiffany’s signature. The St Francis Chapel was designed with the intent of prominently displaying Tiffany’s windows. The Arlington Street Church in Boston has 16 Tiffany windows of a set of 20, designed by Frederick Wilson (1858–1932), Tiffany's chief designer for ecclesiastical windows. They were gradually installed between 1889 and 1929. The church archives include designs for 4 additional windows, which were never commissioned due to financial constraints caused by the Great Depression. When funds again became available, Tiffany Studios had gone out of business and its stockpile of glass had been dispersed and lost, ending the prospect of completing the set. Also in the Back Bay district of Boston is Frederick Ayer Mansion, one of three surviving examples of Tiffany interiors, and the only surviving building also possessing exterior mosaics designed by Tiffany. 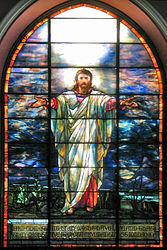 Significant collections of Tiffany windows outside the United States are the 17 windows in the former Erskine and American United Church, now part of the Montreal Museum of Fine Arts in Montreal, Canada, and the two windows in the American Church in Paris, on the Quai d'Orsay, which have been classified as National Monuments by the French government; these were commissioned by Rodman Wanamaker in 1901 for the original American Church building on the right bank of the Seine. The Haworth Art Gallery in Accrington, England contains a collection of over 140 examples of the work of Louis Comfort Tiffany, including vases, tiles, lamps and mosaics. The collection, which claims to be the largest collection of publicly owned Tiffany glass outside of the United States, contains a fine example of an Aquamarine vase and the noted Sulphur Crested Cockatoos mosaic. 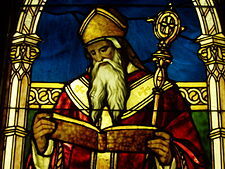 Window of St. Augustine, in the Lightner Museum, St. Augustine, Florida. ^ Warmus, William. 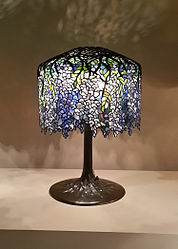 The Essential Louis Comfort Tiffany. New York: Abrams, 2001. Pages 5–8. ^ "Widener University: Distinguished Alumni". Widener University. Archived from the original on July 20, 2008. Retrieved October 6, 2008. ^ Baal-Teshuva, Jacob. Louis Comfort Tiffany. Taschen. pp. 12–14. ^ Baal- Teshuva, Jacob. Louis Comfort Tiffany. Taschen. pp. 22–30. ^ Taylor, Kate (February 13, 2007). "Tiffany's Secret Is Over". New York Sun. Retrieved November 16, 2009. ^ Johnson, Caitlin A. (April 15, 2007). "Tiffany Glass Never Goes Out Of Style". CBS News. Retrieved November 16, 2009. ^ Kastner, Jeffrey (February 25, 2007). "Out of Tiffany's Shadow, a Woman of Light". The New York Times. Retrieved November 16, 2009. ^ Goodman, Vivian (January 14, 2007). 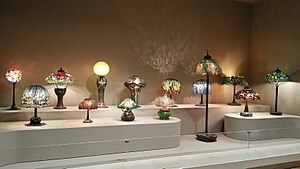 "Exhibition Honors Woman Behind the Tiffany Lamp". NPR. Retrieved November 16, 2009. ^ "Spare Times". The New York Times. April 7, 2006. Retrieved November 16, 2009. ^ "Laurelton Hall, Louis Comfort Tiffany's Long Island estate". www.morsemuseum.org. Retrieved 2019-02-04. ^ Pennoyer, Peter; Walker, Anne; Stern, Robert A. M. (2009). The Architecture of Grosvenor Atterbury. W. W. Norton & Company. p. 270. ISBN 9780393732221. Retrieved 30 January 2019. ^ "Mrs. Parker Weds Francis M. Weld". The New York Times. August 18, 1930. ^ Frelinghuysen, Alice Cooney; Obniski, Monica. "Louis Comfort Tiffany (1848–1933)". The Metropolitan Museum of Art. Retrieved July 31, 2013. ^ "About Tiffany Windows". ASC Tiffany. Foundation for the Preservation of 20 Arlington Street. Retrieved 2017-05-16. ^ a b "Our Windows: A Guide to the Historic Collection of Tiffany Windows" (PDF). Arlington Street Church. Arlington Street Church. Retrieved 2017-05-16. ^ "NHL nomination for Frederick Ayer Mansion" (PDF). National Park Service. Retrieved 2014-05-30. 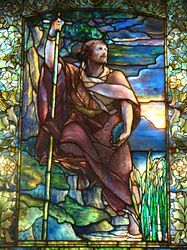 "Featured Windows, Louis C. Tiffany and Tiffany Studios As Seen Through Michigan Stained Glass Windows". Michigan Stained Glass Census. May–June 2008. Retrieved February 18, 2012. 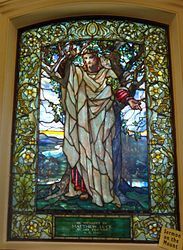 Wikimedia Commons has media related to Louis Comfort Tiffany. Wikisource has the text of the 1911 Encyclopædia Britannica article Tiffany, Louis Comfort. Tiffany Treasures: Favrile Glass from Special Collections. Information on the 2009–2010 exhibition at The Corning Museum of Glass. Virtual visit of Tiffany Glass exhibit at the Montreal Museum of Fine Arts (2010). 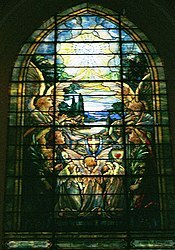 Tiffany windows at Reid Memorial Presbyterian Church in Richmond, Indiana. This page was last edited on 27 February 2019, at 12:12 (UTC).